A fantastic turnout for the Town Mayors Councillor Mrs Seddon’s final charity fund raising Bingo Night for her year in office, with over 75 attendees at the Hilltops Social Club and a fantastic sum raised of over £800 for charitable causes. The Town Mayor was joined by other local civic dignitaries from nearby towns and ably helped by a group of local residents. Prizes galore and pastie and peas all went down well with those attending all declaring it to be excellent event. Thankyou to all. 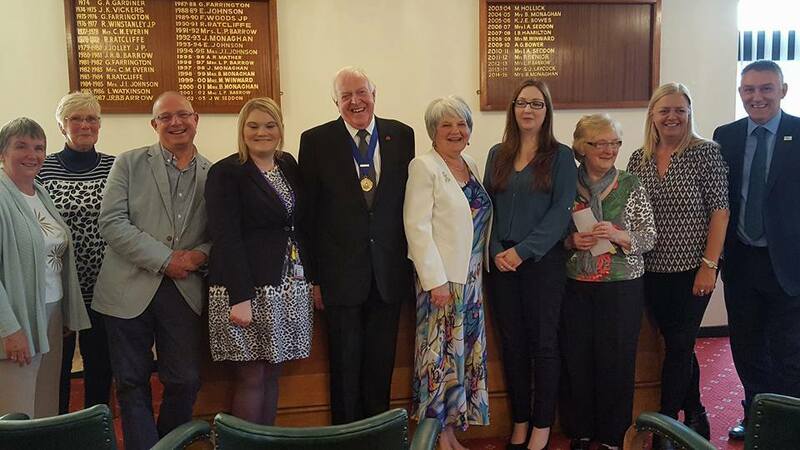 Once again a fantastic sum of money was raised at the latest Town Mayors Charity Fund Raising Event with over £450 being added to the annual fund raising events undertaken by Blackrod’s Mayor. The Town Mayor Councillor Mrs Isabel Seddon was ably assisted at the event by a willing group of helpers and pasties and peas were served to those present which capped off a very enjoyable fund raising activity. Thank you is also given to the staff at the Hilltops for their welcomed assistance on the night. The next Mayors event Charity Bingo at Hilltops Social Club is on Friday 10th November from 7.00pm Eyes down 7.30pm. Tickets £4, to include a pasty and peas. Tickets available from the Town Clerk and other members of the community. Mayor’s News: Coffee morning, thank you! Thank you to everyone who assisted and help raise almost £300 at the recent coffee morning on 19th October. The new Town Mayor / Chairman of Blackrod has been voted in for 2017 – 2018. Councillor Mrs Isabel Seddon took up her role on 8th May 2017 and will be ably supported by her Consort Mr Ian Hamilton, a former Town Council member and the newly appointed Deputy Mayor/ Chairman Councillor Scott Batchelor. Look out for charity events being ran throughout the year in aid of the Mayor’s Charity. Anyone wishing to contact the Town Mayor can do so by contacting the Office of the Town Clerk. The current Mayor of Blackrod Councillor Ann Cunliffe will retire from the role at the Town Council Annual Meeting to be held on 8th May 2017. The new Mayor of Blackrod will then be duly elected and take up office from that date. Members of the public are welcomed at the Annual Meeting, which commences at 7.15pm. The Town Council Christmas Tree was lit up in Blackrod with the help of the Blackrod Youth Council and invited guests, including Blackrod Mayor Councillor Cunliffe and Consort Mr Jim Brooks. This event saw a large increase in people attending the event and many made their way to St Andrews Hall for a seasonal glass of mulled wine and mince pies, whilst being entertained by the marvellous Blackrod Community Choir. The Town Mayor would like to thank all those who attended and giving generously to the Town Mayor’s Charity, through the organised tombola and to those in Rhapsody Academy for their generosity in providing the room freely for the occasion. Remembrance 11th November. Huge crowds turned out for the recent Remembrance Service on Sunday 13th November 2016. Following a service at the Cenotaph within the Blackrod Cemetery the crowds including Civic Guests marched through the village to St Katharine’s Church, ably accompanied by the Greenfield Band. Warming Refreshments were served to those who had participated in the event, which was provided by the Town Council. The Town Mayor would like to say thanks all those who attended the recent evening with the Travelling Strings held in the Hilltops Social Club. The event raised over £600 towards the Mayor’s Charities and thanks everyone for the kind generosity. Mayor’s News: Body Shop At Home Party, Thursday 8th September. Body Shop At Home Party, Thursday 8th September. To be held in the Council Chambers in the Library building. Doors open at 7pm for a 7.30pm start. Tickets just £2.00. The Town Mayor Councillor Ann Cunliffe warmly thanks all those who visited the Town Council Chambers on Sunday 2nd July for Tea and Cake with the Mayor and for their kind donations to this year’s charitable causes. Pictured: Centre. The 2015/16 retiring Mayor Councillor Hollick and retiring Mayoress Mrs Janet Milward. The Mayor would be delighted to attend any community activities within the village, including schools, churches, fund raising activities and community groups. Please contact the Office of the Town Clerk for more information. They made fairy wish jars, met Tinkerbell and the Mayor of Blackrod who presented all the Rainbows with a special certificate saying they were the first people to ever sleep in her Council Chamber. Anne Burns read extracts from the BFG and Peter Pan, they had a Treasure Hunt and found naughty fairies hiding in the library, made cute cuddly toys, ate hot dogs for supper and had 3 bedtime stories. In the morning they had even more stories and wrote down everything everyone had enjoyed about the sleepover. Blackrod welcomes their new Mayor for 2016 – 2017, Councillor Ann Cunliffe. Blackrod welcomes their new Mayor for 2015 – 2016, Councillor Michael Hollick. Blackrod welcomes their new Mayor for 2014 – 2015, Councillor Beryl Monaghan.